Urgent care in Greater Los Angeles can be a hassle when you have to submit to the possibility of being infected by contagious patients in the waiting room at urgent care. Glendale residents want something that is more convenient, such as the possible of having someone come to them instead of the other way around. 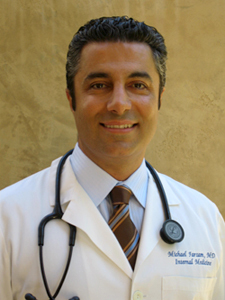 Doctors that make house calls still exist in the 21st century, and board-certified internist Dr. Michael Farzam is among them, and he runs House Call Doctor Los Angeles and regularly provides urgent care in Glendale. House call doctors such as Dr. Farzam are able to attend to almost any ailment imaginable, except those which necessitate emergency care, such as something that would require calling 911. Urgent care Glendale can expect from Dr. Farzam includes attending to traumatic injuries, acute illnesses and chronic disease flare ups, among other problems. House call physicians also can attend to routine healthcare such as executive physicals or drawing blood for testing. Dr. Farzam is proud to provide urgent care Glendale can count on, and has been a house call doctor for the past several decades. If you are in need of urgent care in Greater Los Angeles, simply call House Call Doctor Los Angeles today to learn more. We can provide fee schedules and other information. Dr. Farzam will arrive at your location usually within an hour or less of you making a phone call, and appointments typically last 45 minutes, or three times longer than the appointment you'd expect at the typical urgent care clinic! Call 310-849-7991 today.